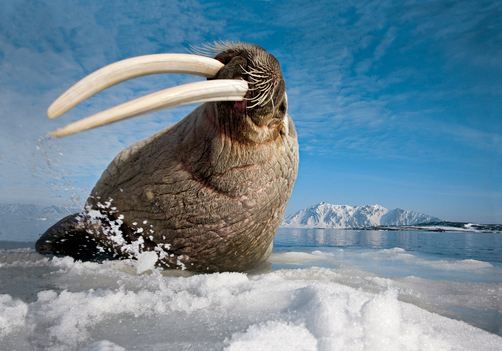 Paul Nicklen is one of the world’s leading wildlife photographers. 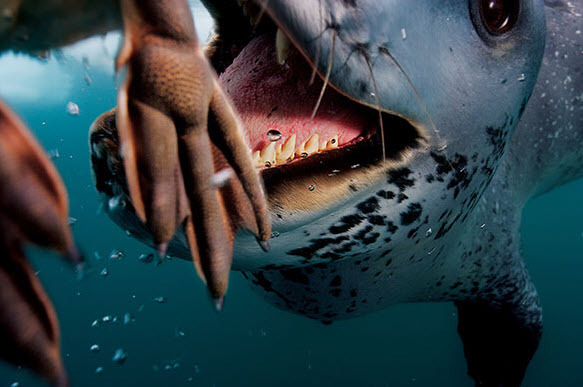 His staggering, transformative shots of the Polar Regions and their inhabitants, including leopard seals, whales, walruses, polar bears, penguins and narwhals, have been making waves for nearly 20 years. You don’t have to take my word for it. Read about his copious honours (multiple World Press awards; First Prize at the 2010 American Photo Images of the Year; Up Here Magazine’s 2010 Northerner of the Year; 2008 Shell Wildlife Photographer of the Year; 2000/2001 BBC Wildlife Magazine Photographer of the Year) and publications (National Geographic – see his outstanding 2010 cover story on the Spirit Bear; Canadian Geographic; Rolling Stone Magazine; BBC Wildlife Magazine; TIME Magazine; Maclean’s; National Wildlife Magazine), or have a look at his books Seasons of the Arctic and Polar Obsession. Listen to one of his talks and let him tell you about his incredible experiences (TED 2011: The Rediscovery of Wonder; Annenberg Space for Photography). Information about Paul’s life and accomplishments abounds. That’s one reason I’m not going to chronicle it all here, in typical fashion. They say a picture is worth a thousand words, and I wholeheartedly agree. But given that assembling a photo essay of Paul’s life isn’t an option just now, I’ll try instead to put a picture into words. A few pictures, actually. Here are five images that come to mind after poring over the material available on this very unique Canadian, getting lost in his latest book, Polar Obsession, and chatting with him via phone from Nanoose Bay, British Columbia, as he gazed at sea lions and harbour seals and I got a glimpse into his extraordinary existence. 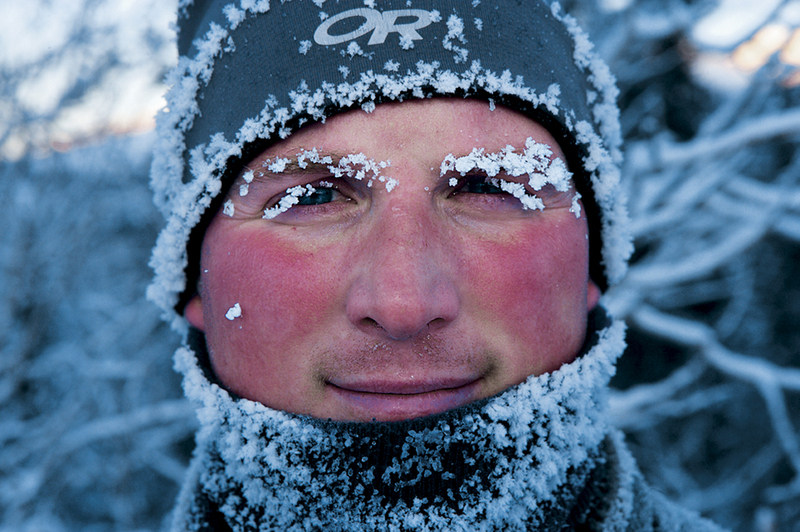 A young boy lies in the foreground, face up and surrounded by blue-tinted snow. A bank curls over top of him, casting him in a darker light than the background, which glistens and glows with the snow that races across the horizon, blending sky and land. The boy is bundled in thick winter clothes: reddish-brown woolen hat and scarf, one-piece blue snowsuit, black lace-up boots. His white cheeks—what’s visible of them through the scratchy wool—have turned mostly red from the cold. His eyelashes are nests of frost. But he shows no resistance to the snow gathering over him. Tufts of his breath blend with the snowdrifts that dance through the air. A half-smile peers through the folds of his scarf. He isn’t hurt. He’s exhilarated. He’s thrilled. He’s at home. He grew up in this land of Inuit people, who understand and revere the rhythms of nature. The rushing wind, surely whistling, at times even screaming, is an enchanting melody to his ears. For him, the winter storm doesn’t foretell death; it’s a sign of life in the North, of continuity and nature and all its awesome powers. There’s nowhere else this boy could be but right here in the heart of it. In a makeshift darkroom, a set of young fingers pokes into the frame, clutching a photo in the foreground. The image is of a baby seal lying on a snowy bank, gazing up at the camera with a look of curiosity. It’s freshly developed; fluid still drips from the paper. Behind the photo of the seal, a row of black and white images hangs to dry. Glimpses of frozen tundra and seascape fall in line, growing smaller and smaller as they near the background. One photo shows seagulls flying over snow-covered hills that stand like billowing mounds of vanilla ice cream, frozen treats to numb your toes and warm your heart. In the far corner of the room stands an adult woman, her back to the camera. Her hair spills over her shoulder, which is cloaked in a dark sweater. She’s turned away to focus on something in front of her, probably another photograph. Though they’re in the same small storage room, both the woman and her young companion are lost in worlds of their own imagining. The young fingers in the foreground are whitest at the tips, pressed hard against the photo; the child grasps it tightly, as if entranced by the seal’s expression. It’s easy to imagine this child falling asleep to thoughts of Jacques Cousteau and his expeditions to the most isolated regions of the planet, utterly gripped by the images he’s already seen and compelled to capture even greater ones. In a postcard-perfect moment, a male scuba diver—legs splayed as he kicks, flippers extended—clasps his camera, staring intently as his subject, which is just out of frame. Bubbles travel from his mouthpiece back to the surface, but he clearly has no thought for the world above sea. He’s surrounded by blue waters, and by coral, rockfish, sponge, anemone, scallops and sea urchins of all colours. And that stray octopus tentacle in the right corner of frame, pulling his gaze from all else around him. Even through his mask, the spark in his eyes shines through; a childlike glimmer as he and his camera take in the rest of the creature’s undulating body. There’s no chance that the diver’s thoughts rest even for a minute on the everyday trials of life on dry land—things like biology exams and papers waiting to be written. Nothing could be further from his mind. A roughly chiseled crevasse appears in the centre of the ice wall that frames the image. Through the gap, a lone polar bear far off in the distance perches on a fragment of ice barely big enough to support him. 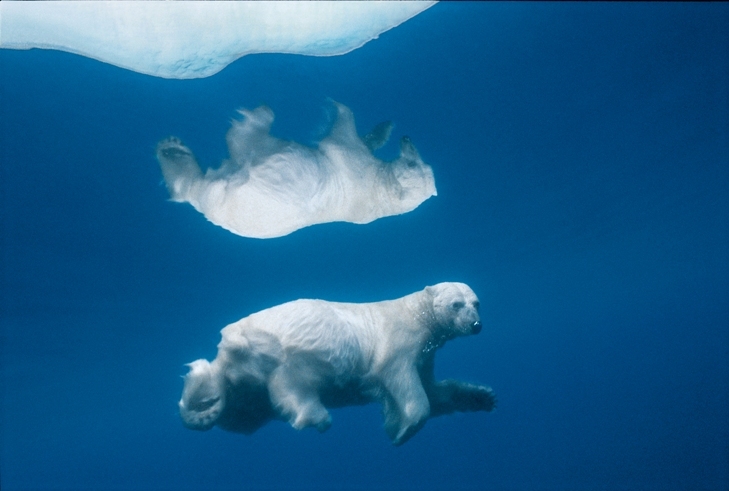 From the ripples in the water, it appears that the ice, along with the bear, is drifting even further away. A drop of water clings precariously to the top of the break in the ice wall, milliseconds from falling to the bottom. Paul is intent on doing everything he can to change that last picture. He’ll literally go to the ends of the Earth, if that’s what it takes. Part of his solution includes forming an NGO called SeaChange (Sea stands for “storytelling for environmental action”), which he describes as a multimedia SWAT team for the oceans. He plans to continue his work as a photojournalist, but feels the pressing need to increase his efforts to make people aware of what’s really happening to our environment and what’s at stake if we continue along the same path. It’s an overused expression, but in this case it’s apropos: Paul has truly devoted his life to putting a face to the North—and what we stand to lose if Polar ice keeps melting. His job regularly puts him in grave physical danger and requires that he be away from home more than nine months of the year. He couldn’t imagine living any other way; he’s driven to get his message across before entire ecosystems are lost forever. “If we lose sharks, for example, we lose entire coral reef ecosystems,” he says. “If we lose ice, we lose polar bears. If we lose the rain forest, we lose Spirit Bears.” Still, his convictions have come at a high cost. Because of the unusual and rigorous demands of his career, he’s had to set aside the dream of having children of his own. Paul may have forfeited the opportunity to create life in the strictest sense. But he is allowing for the possibility of continued life for every creature on Earth. He’s doing his utmost to make the planet stronger and healthier, just as a father is meant to do for his child. For the latest on Paul, ‘Like’ his Facebook page, follow @PaulNicklen on Twitter and visit paulnicklen.com. Thank you very much to Kickass Canadian Norm Hann for recommending Paul. 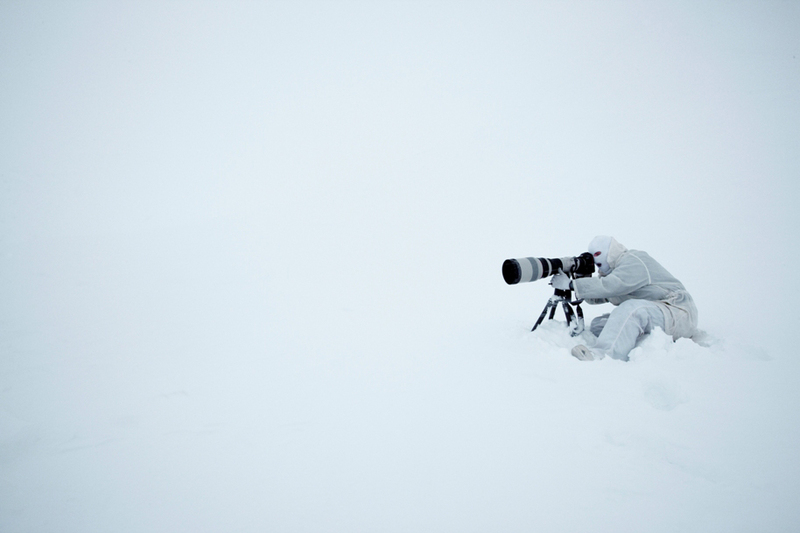 Paul’s images have made an immense contribution to promoting the Canadian Arctic. He is an awesome addition to the Kickass web site! Thanks Richard! Awesome is right… I’m utterly in awe of his photos. Still, that’s high praise from you, of all people. I’m proud to have you both on this site. What an amazing article that was – the writing style and format were really compelling. Also I am absolutely haunted by that shot of the polar bear… If that was the only image I had to look at for the rest of my life, I would be happy. My parents lived in Cambridge Bay with my two other sisters for years and I’ve always been fascinated by the north… I like these articles that both teach me new things about new people, but remind me of things that fascinate me and have played a part in my life, too. And that thing about the paternal instincts made me teary-eyed. It’s a wonderful perspective to take on that, and again one that I’ve wondered about myself. I guess the existential question some of us ask ourselves is, will I contribute more by having and raising my own children, or by focusing on other very important needs that already exist in the world? It sure isn’t a one-size-fits-all answer, is it. Nice to read this morning, in any case… Merci! Thanks for the lovely comment, Camille. The polar bear photo (I agree, it’s unforgettable) is the cover of Paul’s latest book, Polar Obsession, which I now have. I’ll show it to you sometime (though it’s too heavy to bring to our next visit).